House 8810 recently worked with the very talented ladies from The Crafting Chicks to help us with our very first CRAFT CHALLENGE!!! 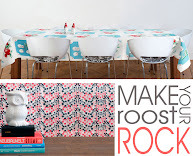 We sent each Chick a tablecloth from House 8810 and asked them to turn it into something fabulous. Well, that is exactly what they did! Now, we need YOUR help. One of these lucky Chicks will be the winner of this craft challenge and you will be the judge. Just leave us a comment on which transformation is your favorite. We will announce the winner on Monday, May 9th. The winner will receive a lovely package from House 8810. Thanks for your help and thanks to The Crafting Chicks for making our first craft challenge so much fun! BECKY received the Mixed Berries tablecloth. How cute is this little number? And the precious girl wearing it? 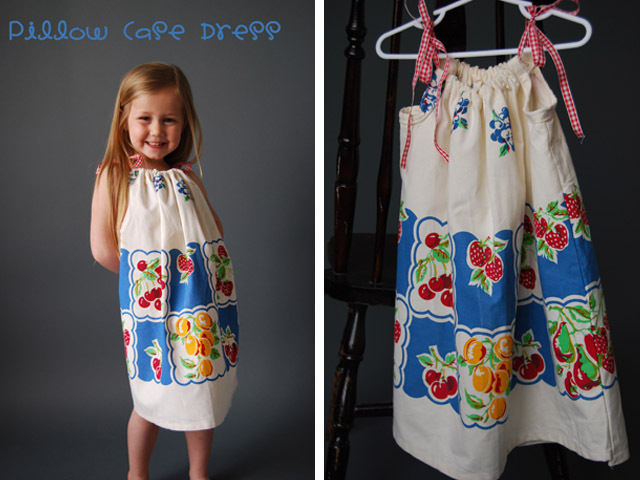 Becky used the tablecloth to make a pillowcase dress for her oldest daughter. Becky says: "She loves it. I think the vintage flare of the table cloth print goes perfect with this dress pattern." To vote for Becky write "BECKY" in the comments section. BROOKE received the Cottage Rose tablecloth. Brooke went techy with her challenge. 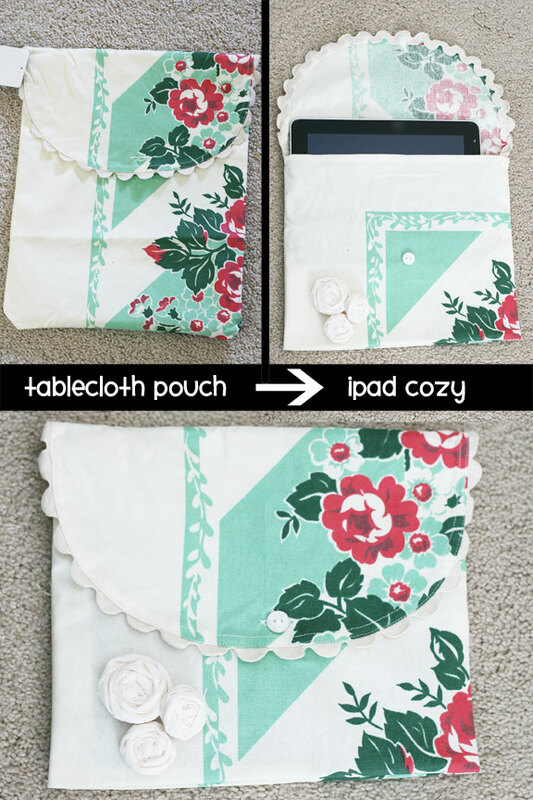 She used the pouch that the tablecloth came in and made an iPad cozy! What a great idea! Brooke says: "I made the iPad cozy by shortening the length of the pouch so that it fit the dimensions of my iPad. You could stitch it up or simply use one of those Heat 'n Bond strips to "hem" it. I already loved the rounded flap and the large rick rack that trimmed it out, so all I did was cut some strips of the tablecloth fabric and made them into small rolled up fabric flowers and added them to the front of the cozy. That's it!!! Totally simple but totally useful to me! :)" Easy Peasy! Those are the kinds of craft projects we like. To vote for Brooke write "BROOKE" in the comments section. NIKKALA received the Berry Delight tablecloth. Nikkala made an adorable picnic blanket. And it's even quilted! Nikkala says: "As soon as I saw this tablecloth I knew that my project had to be something for the outdoors! It is so bright and summery. Finally, I settled on a picnic blanket. Although the weather in northern Utah hasn't been very cooperative for picnics :). The back is a lime green zebra print, and it is a super fun blanket. My two year old loves to name the fruits on it." How awesome is that? Functional AND educational! Love it! To vote for Nikkala write "NIKKALA" in the comments section. JAMIE received the Howdy Buckaroo tablecloth. 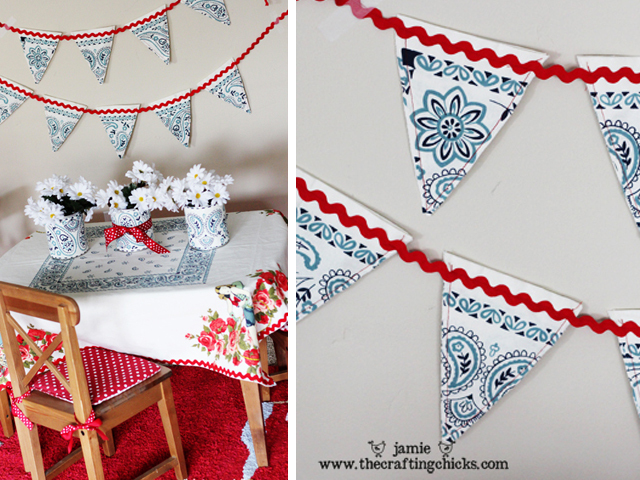 Jamie has been wanting to add a little decor to her children's playroom so she made a tablecloth to fit the tiny table and a bunting to match. She also made flower vases! Nothing went to waste with this challenge. This turned out so cute, and you know we LOVE bunting at House 8810. Jamie says: "I cut the paisley off around the edge of the tablecloth, and hemmed the edges and added red ric rac to the new mini tablecloth. I couldn't let the darling paisley part go to waste so I made a little decor...penants to hang above the table (i love penants) and I wrapped some empty "chow mein" noodle cans with the same material and made them into vases by adding white daisies." To vote for Jamie write "JAMIE" in the comments section. KIRSTEN received the Birds the Word tablecloth. 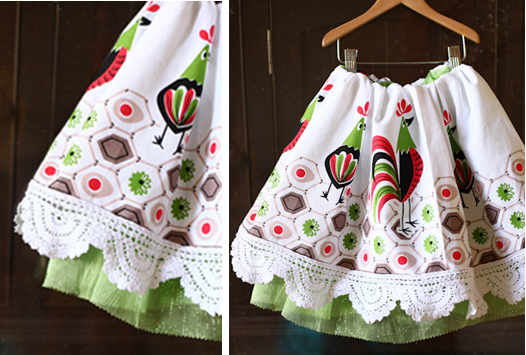 Kirsten made this adorable skirt for her daughter. I love how we can get a little more creative when it comes to our children's wardrobe. Kirsten used only things that she had around the house and it turned out beautifully! Kirsten says: "I decided to make a skirt for my 2½ year-old girl. I had so many ideas of things like wall hangings, matching mother/daughter aprons, then I decided to make this fun skirt. I measured one of my daughter's little skirts and just improvised. My mom improvises in sewing all the time, so I thought I would try my luck. The outer part of the skirt is from your cute tablecloth, and the underneath part, is a sparkly green chiffon fabric. My goal was to use only things I had on hand, it was a blast, thanks for the fun opportunity!!!" You're welcome! And your improv skills are amazing :) To vote for Kirsten write "KIRSTEN" in the comments section. Also, be sure and check out The Crafting Chicks blog for their take on this fun challenge and many other wonderful craft ideas! Hope you enjoyed this craft challenge and that it has inspired you to get crafting! Love all of them, but like Kirsten's best. Wow! Those tablecloths are gorgeous and they all look fabulous! Great job Crafting Chicks! Tough one! But my vote goes to Kristen! Cute skirt! So cute! I love Jamie's the best! Love Jamie's bunting! voting for it! I love Becky's! Her's is the most useful I think and I would love to have those for my little girls! I love Nikkala's blanket. I'd take it on a picnic date! Becky! Both original and useful. Can't beat the cute girl wearing it either. Jamies is the most creative! They are all cute, but Jamies is the most creative. So adorable! My vote is for Jamie! Becky!!! And not even because she is my friend... I really like it best! Becky for sure! My little girl would DIE for that dress. I just love that sweet dress that Becky made. #1 gets my vote! I love Jamie's project. It's adorable and not a scrap went to waste. I love them all, but my vote is for my friend Becky! They are all so cute, but my favorite is the dress by Becky! I love them all, but Kirsten's made me swoon. Darling! I vote for Becky. I love Nikkala's blanket, the zebra is so fun! I'm torn between the skirt and the dress. I would love either for my girls! But, if I had to choose I would probably have to say the dress that Becky made. I would use that more often. Jamie, hers is so creative and different than what you would expect to make out of a tablecloth. I really love Jamies cute banner! I vote for cute Jamie! Too cute! Oh, I love these! Jamies is my favorite. This is so tough, I seriously love them all. Great job ladies! Nikkala's blanket is my fave! i love nikkala's quilt! what a great idea for summertime! Becky's Pillow dress is AwEsOmE!!!! Nikkala - I think that quilt is adorable and probably took a lot of time to make too! They were all so adorable! Nikkala's is my most favorite though! I vote for NIKKALA's adorable picnic blanket and basket liner. So cute. The tablecloth's are all beautiful. They are all fab, but Nikkala's is awesome!!! Good job ladies!!! I love jamies cute playroom decor! Nikkala- Love having a cozy picnic blanket for napping after picnic delights! KIRSTEN...I want one of those for me! WOW this is hard! I'd say Nikkala (that quilt is GORGEOUS) and Becky, because I seriously want to shrink down and wear that dress. They're all fabulous, though! I got to get me a tablecloth! hard to choose between Jamie and Nikayla but I VOTE Nikayla!!!!! Nikkala - absolutely adorable. I love quilts anyway, but great idea to make one from that cute tablecloth. I think Nikkala's quilt is awesome! Love these ideas. Nikkala's idea made me think of summer and we all need a bit of summer here in Idaho. Nikkala wins in my book. Nikkala! Seriously, a quilt from a table cloth is creative. I prefer Nikkala's project. I would definitely make it for myself. LOVE the tablecloths. I love their vintage flair. My favorite is NIKKALA Berry Delight picnic quilt. I love them all, but I think my vote goes to Jamie. My vote is for...... JAMIE! NIKKALA! Picnics in the park with a fun quilt, what could be better. What fun ideas. Nikkala's idea is my favorite. I hope she wins. Love them all but my vote goes to Jamie. Fabulous ideas ladies! My vote goes to JAMIE!!! I love the "quilt" by Nikkala but they are all great and beautiful. I love Nikkala and her quilt. That quilt is darling! I vote for Nikkala. I love vote for Becky! I love the pillowcase dress. Great for summer outfit and useful as a swimsuit coverup also. I think all the crafty mix-ups did a great job with using the material creatively! I like how JAMIE used her tablecloth for many different things, however, and left no waste! My vote is for Jamie. I love that print! Nikkala's quilt is great. Love it! I vote for Nikkala's blanket! Nikkala is my vote, although they are all cute! I love Jamies! Too cute. BROOKE. But I liked them all. Good work ladies! I'll pick . . . JAMIE! These are all so Cute! Becky is my winner! That pillowcase dress is begging for summer BBQs and sleeping outside. I love it!